When we saw the Ultimate Target Stand at the 2012 SHOT Show, we immediately saw value of having it on our hunting trips, as well as at the range. Most everyone who goes to a hunting camp knows someone who failed to properly sight in their rifle. Everyone in camp scrambles for an empty cardboard box or piece of paper to put up against a tree or mound of dirt. It can be, and usually is, a real pain. Or, as happened to Jim on his Ibex hunt two years ago when he fell and knocked his scope loose. We had to find a box, rocks for ballast and pen to mark a bulls eye on the box for him to realign his muzzleloader. We would up emptying some of our supplies from one box to another to use as the target. If we had this device, our job would have been a lot easier and the task of sighting in Jim's rifle would have been more efficient. On our local range, we have 25, 50, 100 and 200 yard berms. If you what to shoot at distances between those, you have to bring your own target frame. Most shooters who do, have heavy wooden or steel structures that take up half the bed of their truck. If the regular ranges are full, you have to go to the pits to shoot, where no target frames are provided. Again, you need your own target frame. Wood, metal or the Caldwell stand? The choice is a no-brainer. 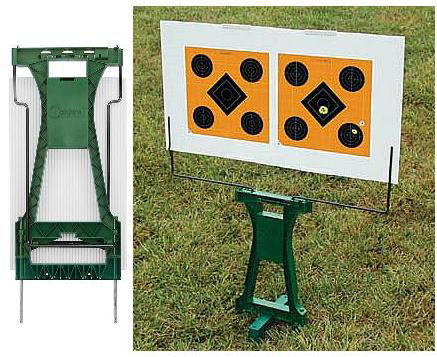 The Ultimate Target Stand is constructed of an all-weather, moisture resistant polymer; it is lightweight. It measures 10-1/2" wide and 24" high when folded and is the ideal solution for all of the above problems. The stabilizer base stores on the steel spikes and removes for installation in the middle of the base to provide front to back stability in windy conditions. When the metal target frame arms are snapped into the upright position, they securely hold a piece of backer board (included) that measures 18"x32", large enough to hold two 15" targets. Not pictured in the illustration of the device is the Center Target Support, which snaps easily in place to provide stability in the middle of the backer board. To insure that it doesn't get misplaced between outings, there is a storage box built into the frame that can also be used to hold extra target pasters or staples. All things considered, the Caldwell Ultimate Target Stand is very reasonably priced with an MSRP of $29.99. Unless you decide to shoot holes in the frame, it will last for more years than most of us have left to shoot. A two-pack of replacement backer boards are available at $9.99. It is the same material as the foam Science Fair boards sold at hobby stores for about the same price. Caldwell is not trying to make a bunch of extra money on the replacements. In fact, the Caldwell backer boards are tri-fold, making transport and storage easy. The stuff from the hobby stores has to be cut to fit, not fun, especially when you consider that you aren't saving any money. If you do much shooting or venture into the field to hunt, the Ultimate Target Stand should be a part of your equipment.